Scott speed is coming on the show this weekend so if you have a question for him, place it here and It should get asked in the show. Also there will be a call in episode this Sunday at 11pm eastern time / 8pm pacific. If your interested in going in, leave a message here for the Skype info, if you are already in contact with the show on Skype, send a message there. On this weeks guest episode I sit down with Mike Garland of Carlisle Events, the home of several major car shows in central Pennsylvania. Mike tells us how Carlisle Events was founded by two guys who got thrown out of the Hershey, PA car show, and has since grown to host some of the largest automotive events on the east coast. We hear about what Mike does for Carlisle, how he got involved with them in the first place, how he accepted the job with them during another interview, and how not being a car guy himself actually helps him do his job. Mike tells us a bit about what the fairground is like. It’s not just a bunch of cars in a field. 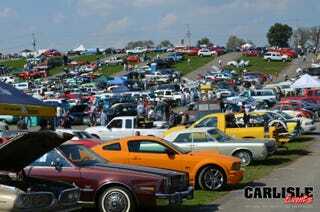 Carlisle brings some of the people who designed the cars to the shows so owners can meet them. There is on-site camping for some events, vendor installs, and driving events such as autocross, drifting, and burnout contests.